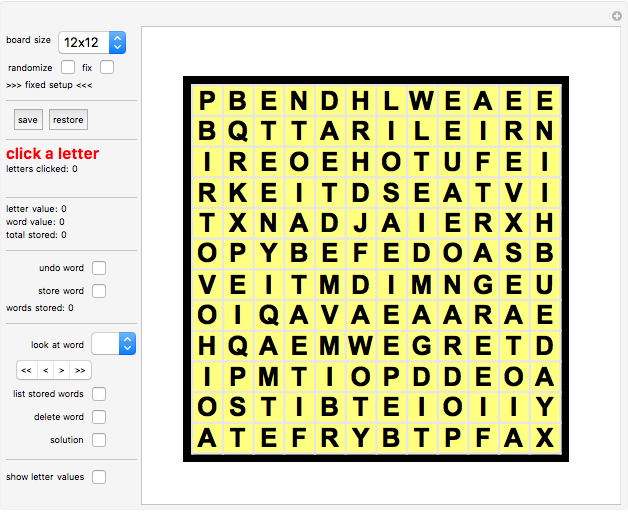 Object: find as many words as you can on the board. To spell a word, click a series of letters, where each letter is adjacent (in one of the eight primary directions) to the previous one. You can compete with several other people in finding the most valuable set of words (different letters have different values). You can use the given setups (board sizes 7x7 up to 15x15) or create randomized setups. You can store the words you find. The program calculates the word value and the total value of your stored words. Each word must be at least three letters long. The new word is marked on the main board by a red disk (first letter), orange disks (other letters), and a thin red line that connects the letters of this word. You cannot visit the same position twice while creating a word. After a given time, the competitors compare notes and determine the winner (the one who found words worth the most points). 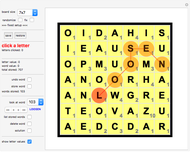 Of course, you can also play Wordfinder as a solitaire game. Advanced level Each word must be at least four letters long. 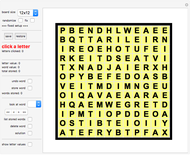 Expert level Each word must be at least five letters long. Controls Select the size of the board with pop-up menu "board size". A fixed setup will be given. Check "randomize" to create a random setup. Check "fix" to return to the fixed setup. The text in the next line tells you whether you are currently using a "randomized" or a "fixed" setup. Click "save" to store the current setup; click "restore" to bring back the saved setup. The next line tells you (in red letters) what to do next: "Click a letter." 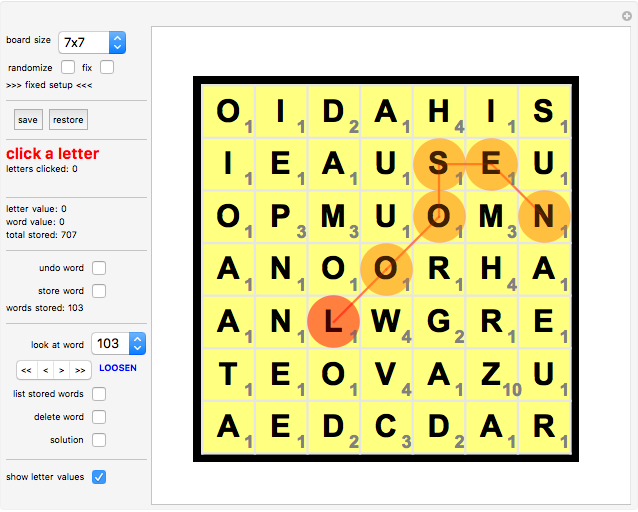 "Letters clicked:" tells you how many letters you have clicked for the current word. The next line shows you the currently created word. "letter value" shows you the value of the letter last clicked. "word value" shows you the value of the currently created word. "total stored" shows you the total value of all stored letters. "undo word" resets the current word. "store word" stores the current word. 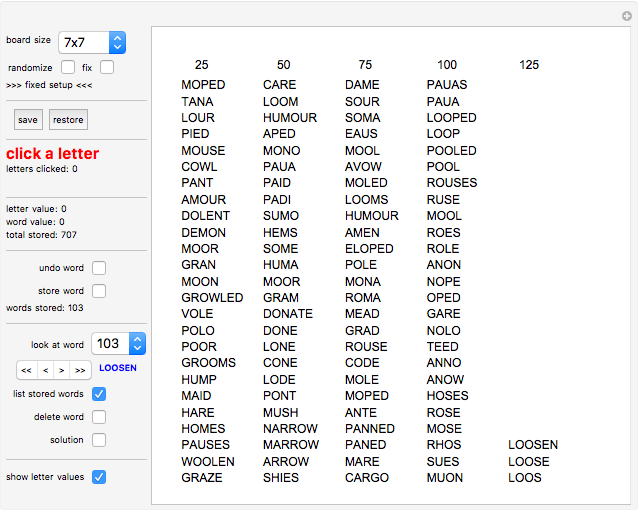 "words stored" shows how many words you have found. "look at word" lets you select a stored word. "<<,<,>,>>" lets you navigate through the set of stored words: "<<" goes 10 entries back (if that is not possible, it goes to the first stored word). "<" goes one word back. ">" goes one word forward. ">>" goes 10 entries forward (if that is not possible, it goes to the last stored word). To the right, the stored word is displayed (if there is one). 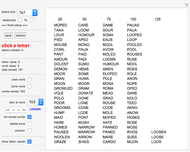 Click "list stored words" to display all stored words at once on the main board. Click "list stored words" again to go back to normal play. Click "delete word" to delete the currently presented stored word. "solution" is only available for the fixed 7x7 board. It brings up all the words the author found.